We do things a little differently here, whether it’s the brewing of our beer or the way we offer to make things right (Ask us about our beer guarantee). This year we are celebrating 13 years in business, which to some people might be something you should just get through rather than call attention to it. We say sing it from the rooftops, bring on the black cats, sidewalk cracks and ladders. Ringing in 13 years is a proud feat, particularly as we look back through the years. When we started this restaurant we knew very little about brewing and were not yet worthy of the title restaurateur (we still aren’t, being uncomfortable as we are with pronouncing words derived from French, though we do love our Québécois patrons!). We had an idea and were determined to make it work. The streets weren’t bustling and our compatriots in downtown Glens Falls could be counted on one hand, but little by little our knowledge and neighbors grew. Standing in Exchange Street Plaza today the landscape of Glens Falls is more than we could have ever hoped for and to be celebrating 13 years with the rich community of shops and eateries is nothing short of amazing. Some people like belt buckles, some people collect spoons, us? Well, we like tap handles. Call us quirky, but these nifty knobs and levers just do it for us. 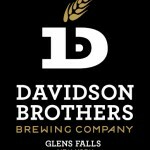 Each Davidson beer is crafted with care, precision and passion. 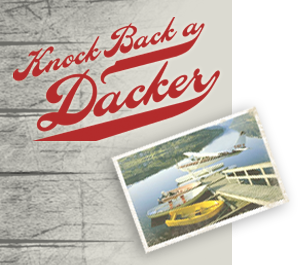 Our handles should be rendered with every bit as much energy as they are the face of our beers in over eighty locations throughout the Adirondacks. The process of designing and creating the taphandles was not exactly what we’d call easy, but it was worth it. 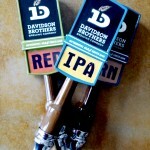 We’ll be sending out three new tap handles for our external locations. The Davidson mark sits atop each handle and their colors are drawn from the best of the Adirondacks— the green of a lush hiking trail after a late spring rain, the deep smoky blue of rocks through coursing river water and the irresistible blue of lake water sluicing over a white oar on a summer’s day. Sound over the top? Wait until you taste our beer. After 12 years in business, we decided that, hey, maybe this gig was a good idea after all. Despite having served us incredibly well, we made the long trek to Trampoline Design (maybe 200 yards if you include the flight of stairs) to begin the process of getting a new logo. These guys drink our beer, order our specials and know things like whether it should be blue or black or gold. Personally, we think it should taste good, the beer, not the logo, but hey, what do we know, maybe logos can be tasty…fast forward a few months and lo, our new mark proved very tasty indeed to the folks at the Albany Ad Club where it one the Identity category of the 2088 Nori’s. Our old logo, beloved and bearing our faces, will now be available on “Limited Edition Merchandise” (read: yet-to-be-sold) available at our restaurant. The new mark, while I am still a bit mystified that they took our faces off, has a modern spin and makes it clear that we like beer. From here on out, DB marks the spot for good beer.